What a coincidence: just as Comrade Duch, infamous chief of the Tuol Sleng S-21 prison, is facing his trial, Volume 18 of FOTH comes out… We should really say "South-East asian", as most of the songs come from Cambodia with a peppering of Thai Beat. If you've never hear about Cambodian Rock, you're in for a surprise! This has nothing to do with piped-in music you heard at your local noodle shop.No, we're talking about the savagest fusion ever recorded between the East and the West. Cambodia in the late 60's was on the brink of disaster: bombed secretly by the US, with the Viet Cong operating from some of its provinces, a rising mad Communist rebellion and a chronically weak and corrupted government, it was tethering on the brink of hell. Bad as things were, the music scene was thriving and the proximity of US Radios inspired them to create a strange two-headed hybrid: combine the cambodian love of the drums and cymbals and US guitar heavy psych, you'll get the most danceable, raucous breed of 60's Rock. 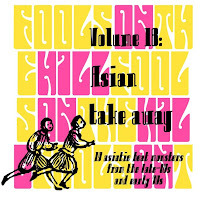 The vocals are most peculiar: the high-pitched voices of the female singers are very asian, but you will soon forget that you can't understand a word of it. If you hear "Coca Light, Coca Light" as a chorus, you're bound to be wrong. Same applies to "Fraulein" which pops repetedly in the songs… God only knows what it means. On the other hand, the Thais only get a passing mention because, true to their roots, they much prefer sweet love songs and these pale in comparison with the energy of the cambodian songs. 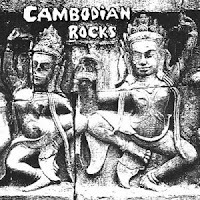 You'll find more info about Cambodian Rock and the aptly named "Don't Think I've Forgotten" film on this site. This is the album that started it all: Terrible sound quality, unnamed songs and artists but groundbreaking. Amazon link on pic. You can also get the newer version (4 volumes, color covers), much better sound, liner notes etc. Without forgeting Chhom Nimol pretty smile… she's the singer of Dengue Fever, an LA band that started by replaying the old Cambodian Psych and are now moving into newer territories. Much recommended! this is so great! thanks for posting. just getting into khymer pop! Just found your great blog. I've started going through the "Fools..." comps - Great idea. I don't know why there aren't more homemade comps out there (or maybe I haven't looked hard enough), since I use blogs to create my own digital comps anyhow. Plus, i feel less like I'm stealing music and more like getting a cassettes comp from a friend like in the days of old. it's all about contemporary, new psychedelic/experimental/non mainstream music and all posts are approved by the copyright holders, so no worryibg about "stealing music"! Fools On The Hill: new volumes almost ready.